Being a good tarot reader is not just about connecting with your higher self and other spirituality – success comes in many forms and being a tarot reader with a reputation to match means understanding other elements to the spiritual world. Aside from the obvious, knowing the content, you need to talk to is a huge help in many ways. Bringing yourself to the table and incorporating your personality into the tarot reading will get you more validity then you would expect. Think about the reason you have been approached by your clientele. The person that will sit in front of you is looking for direction and guidance. Your intuition and ability to consider all possibilities of a question (including all its potential outcomes) means your client will leave with a holistic idea of what they need to believe in their future endeavors. It is highly likely that the people in your life whether they be family or friends, will all have different attributes that you can apply to the breadth of your clientele. This will enable you to be able to gain further insight into the many types of personalities which will thus enhance your confidence when dealing with the various kinds of personas. Further, practicing with close people will boost your faith which is paramount when reading for strangers. Belief is a crucial element in any type of social setting. It will enable your client to trust the reading you are giving to them and may allow ‘word of mouth’ that will in time expand the base of the work you have. Anybody who has found success in a particular area will tell you that they have just stumbled across it. They have had to read, read and more reading! Understanding the work you do is critical. By reading other people’s success stories, you will be able to ascertain what has worked for them and what has not. Engaging with clients is essential. You will need to speak in a clear, concise and empathetic tone of voice. This will enable everything you are saying is being understood by the client. As stated above, practicing with family and friends and getting feedback from them will show you what you need to improve on. Practice by recording yourself. Tarot reading can at times be demanding, and people will be curious and want you to read for them. Just like anything else, stress levels may be a factor, and you will feel run down. Doing something that relaxes you before reading will put you in a Zen state of mind. You will be able to hold your composure throughout readings, especially on days when things can seem to be crazy. Your personal life will always be with you, but separate yourself before heading into reading and come in with a clear mindset. Your appearance will ultimately depend on you and who you channel to be your higher being. Will you go to the reading dressed in a clean cut fashion or will you channel deeper vibes and incorporate your inner gypsy? The choice is yours! But remember, whatever you choose, you need to ensure you stay true to yourself and read what you feel. This will bring a level of authenticity to your work and will provide you leave the session knowing you have given your all and assisted the different and challenging questions your clients may have. Focus on the type of person you are and the atmosphere you want to create and be known for. Lighting a white candle will help bring in spirituality and sage helps to cleanse the room. 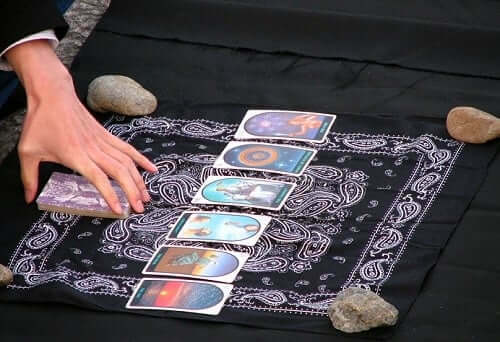 Some great tarot readers are known for an explicit simple setting with great Feng Shui and which incorporates a vibe that allows clients to relax and open their minds. Greenery helps and encourages a fruitful session with room for healing and growth. Bonus Tip: Have a great time, enjoy the many walks of life you will make contact with – the experience will broaden your mind and release you from the bonds of everyday life.